CHARLESTON, W.Va. (AP) — The U.S. Department of Justice says a federal court should not overturn the conviction of former coal baron Don Blankenship. According to the Charleston Gazette-Mail, prosecutors argued Friday Blankenship has not proved information was withheld from his 2015 trial and opposed Blankenship's request for an evidentiary hearing to have his conviction thrown out. CHARLESTON, W.Va. (AP) — A West Virginia newspaper is asking a federal court to unseal documents filed as former coal baron Don Blankenship sought to have his criminal mine safety conviction overturned. CHARLESTON, W.Va. (AP) — The state Supreme Court on Wednesday denied a last-minute bid by former coal CEO Don Blankenship to get his name on the ballot in November's U.S. Senate race in West Virginia. CHARLESTON, W.Va. (AP) — The West Virginia Republican Party is attempting to join the legal fight to keep former coal executive Don Blankenship off the ballot as a third-party candidate for the U.S. Senate. CHARLESTON, W.Va. (AP) — The U.S. Justice Department says prosecutors may have inadvertently neglected to turn over some evidence to defense lawyers in a mine safety case stemming from a 2010 explosion in West Virginia where 29 miners died. CHARLESTON, W.Va. (AP) — Former coal executive Don Blankenship has filed a court challenge to a denial of his third-party candidacy application to run in West Virginia's U.S. Senate race. Blankenship filed the challenge with the state Supreme Court on Thursday. CHARLESTON, W.Va. (AP) — Democrats make up the bulk of signatures so far on a petition to let ex-coal executive Don Blankenship run in West Virginia's U.S. Senate race as the Constitution Party's nominee, preliminary data shows. CHARLESTON, W.Va. (AP) — An election official has blocked former coal executive Don Blankenship's bid to run in West Virginia's U.S. Senate race as the Constitution Party's nominee. News outlets report Secretary of State Mac Warner announced Thursday that he won't approve Blankenship's candidacy application, based on the state's "sore loser" law. The law prohibits major party primary candidates who lose from switching to a minor party. Blankenship finished third in the Republican primary. CHARLESTON, W.Va. (AP) — Former coal executive Don Blankenship has filed paperwork to run in West Virginia's U.S. Senate race as the Constitution Party's nominee. The Charleston Gazette-Mail reports Blankenship filed the documents at the secretary of state's office Tuesday with signatures of an estimated 11,000 registered voters. Blankenship's campaign has said it will "vigorously challenge" any denial of his efforts to be on the ballot. CHARLESTON, W.Va. (AP) — Former coal executive Don Blankenship has filed to run in West Virginia's U.S. Senate race as the Constitution Party's nominee. The Charleston Gazette-Mail reports Blankenship filed documents at the secretary of state's office Tuesday with an estimated 11,000 registered voter signatures. It's unclear whether the bid violates West Virginia's "sore loser" law, which bars major party primary candidates who lose from switching to a minor party. CHARLESTON, W.Va. (AP) — A petition drive has started to place convicted former coal executive Don Blankenship on the West Virginia general election ballot in the U.S. Senate race as the Constitution Party's nominee. Blankenship's campaign announced the petition drive Wednesday. CHARLESTON, W.Va. (AP) — West Virginia's Supreme Court has upheld a ruling that prevents former Massey Energy shareholders from holding company officials liable for poor management leading up to the Upper Big Branch mine disaster. CHARLESTON, W.Va. (AP) — U.S. Attorney Mike Stuart has been recused from representing the federal government in a case involving former Massey Energy CEO Don Blankenship's criminal mine safety conviction. CHARLESTON, W.Va. (AP) — An undeterred Don Blankenship wants to continue his fight to unseat Democratic U.S. Sen. Joe Manchin of West Virginia. But if he gets the opportunity, it could end up helping Manchin instead. After losing the Republican primary in a distant third place, the convicted ex-coal baron announced Monday that he's re-emerged as a third-party candidate. The Constitution Party nominated Blankenship by a unanimous vote, his campaign said in a news release. 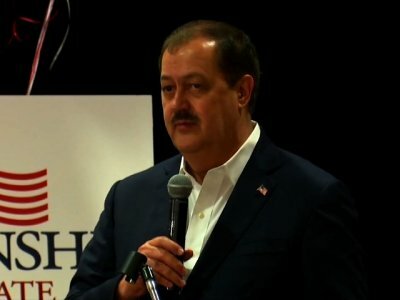 CHARLESTON, W.Va. (AP) — Despite losing the Republican primary in a distant third place, convicted ex-coal baron Don Blankenship announced Monday that he will continue his bid for U.S. Senate as a third-party candidate, though it's unclear if the move violates West Virginia's "sore loser" law. A professor says if Don Blankenship is successful in making the U.S. Senate campaign a three-way race in West Virginia this fall, it "throws everything into uncertainty." CHARLESTON, W.Va. (AP) — Republican voters rejected ex-convict Don Blankenship in a West Virginia Senate primary in which he sold himself as "Trumpier than Trump" but was vigorously opposed by Trump himself. GOP voters in Indiana, meanwhile, chose wealthy businessman Mike Braun over two sitting congressmen to lead the party's charge against a vulnerable Democratic senator in the fall. National Republicans were terrified that West Virginia Republicans might nominate a convicted ex-coal executive for the Senate and give up an opportunity to unseat Democratic Sen. Joe Manchin. President Donald Trump says the GOP "had a great night," after West Virginia Republicans rejected ex-convict Don Blankenship in state's Senate primary. Iran's supreme leader chastises Trump over his decision to pull America out of the 2015 nuclear deal, while lawmakers lit a paper U.S. flag on fire inside parliament, shouting, "Death to America!" Republican voters have rejected ex-convict Don Blankenship in a West Virginia Senate primary in which he sold himself as "Trumpier than Trump" but was vigorously opposed by the president. West Virginia Senate hopeful Don Blankenship claimed this week that the Justice Department is taking another look at the prosecution that sent him to federal prison for a year in connection with the Upper Big Branch mine explosion of 2010. WILLIAMSON, W.Va. — Don Blankenship, Republican candidate for U.S. Senate and former CEO of Massey Energy Company, issued a Golden Horseshoe test challenge to New Jersey/Washington D.C. native Patrick Morrisey last week. Milt Hankins: Is Blankenship a legit Senate candidate? For the past several weeks, Don Blankenship has been running slick, professionally produced political ads ("paid for by Don Blankenship") which will no doubt appeal to those who are convinced he was wrongfully charged and convicted. Let's hope not enough numbskulls will be convinced to select him over his excellent, credentialed primary opponents. Is Blankenship a legit Senate candidate? I'll admit I was surprised when Don Blankenship announced he was running for the U.S. Senate from West Virginia. I never saw it coming. Obviously, he's serious about his campaign. He's coming to Huntington Thursday to answer questions at the Big Sandy Superstore Conference Center. This is his third "meet and greet." He has spoken in Logan and Beckley. I suspect there will be more. HUNTINGTON, W.Va. (AP) — Republican Don Blankenship has scheduled a third town hall-style meeting as the former coal company CEO who spent time in prison continues his campaign for the U.S. Senate. Blankenship's campaign says he will meet with voters on Thursday night at the Big Sandy Superstore Arena and Conference Center in Huntington. Blankenship will give brief remarks and then answer questions from the audience. Here are some things that disgust me. • Advertisements for Don Blankenship running for the U.S. Senate from West Virginia make me nauseous. Remember Blankenship and the Upper Big Branch mine disaster? His year in prison for his crimes? And won't he still be on probation when Election Day comes around? BECKLEY, W.Va. (AP) — Republican Don Blankenship has scheduled another town hall-style meeting as the former coal company CEO who spent time in prison continues his campaign for the U.S. Senate. Blankenship's campaign says he will meet with voters on Thursday in Beckley at the Beckley-Raleigh County Convention Center. The program will begin at 6 p.m.
LOGAN, W.Va. - A former coal company executive who went to prison for charges stemming from the deadliest U.S. mine disaster in four decades kicked off his U.S. Senate bid Thursday evening, telling an audience he backs President Donald President Trump as a real opportunity for West Virginia. LOGAN, W.Va. (AP) — A former coal company CEO who went to prison on charges stemming from the deadliest U.S. mine disaster in decades kicked off his U.S. Senate campaign by trying to persuade a largely working class audience that he identifies with them. But one father whose son died in the 2010 tragedy called the GOP businessman's jump into politics "more of a slap in our face." LOGAN, W.Va. (AP) — A former coal company CEO who went to prison for charges stemming from the deadliest U.S. mine disaster in decades kicked off his U.S. Senate campaigning Thursday, seeking to persuade a largely working class audience that he identified with them. But one father present whose son died in the 2010 tragedy called the GOP businessman's jump into politics "more of a slap in our face." A West Virginia man whose son was killed in the deadliest U.S. mine disaster in four decades says a former coal executive's candidacy for U.S. Senate has brought up some bitter memories for his family. Robert Atkins' 25-year-old son, Jason Atkins, died in the 2010 Upper Big Branch mine explosion that killed 29 men in southern West Virginia. LOGAN, W.Va. (AP) — A former coal company CEO who went to prison is hosting a town hall meeting for voters next week as he revs up his U.S. Senate candidacy. Ex-Massey Energy boss Don Blankenship's campaign said in a news release Wednesday the meeting will be Jan. 18 at the Chief Logan Lodge, Hotel and Conference Center in Logan. Blankenship will face U.S. Rep. Evan Jenkins and West Virginia Attorney General Patrick Morrisey in the May 8 GOP primary. Democrat Joe Manchin is seeking re-election. WILLIAMSON, W.Va. - With the primary election looming in May of this year, Republican U.S. Senate candidate Bo Copley, of Lenore, West Virginia, seems to be overlooked by many political pundits. Copley gained nationwide popularity when he questioned Democratic presidential nominee Hillary Clinton about her stance on coal at a roundtable discussion at a local health clinic in Williamson, West Virginia, in the spring of 2016. The entry of former Massey Energy CEO Don Blankenship into the 2018 Republican U.S. Senate race has generated a great deal of interest from readers. As we all know, the GOP contest to take on Democrat U.S. Sen. Joe Manchin already contained two heavyweights: 3rd District U.S. Rep. Evan Jenkins and Attorney General Patrick Morrisey. CHARLESTON, W.Va. (AP) — In an interview about running for the U.S. Senate from West Virginia, former Massey Energy CEO Don Blankenship is jabbing at incumbent Democratic Sen. Joe Manchin and Republican Congressman Evan Jenkins. Blankenship, whose filing was received Friday, is running as a Republican, like Jenkins and West Virginia Attorney General Patrick Morrisey. Readers of this column are to be congratulated on being ahead of the curve when it comes to "breaking" news. You knew in July that former Massey Energy CEO Don Blankenship is running for the U.S. Senate. You may also recall that I spoke with Blankenship about it and reported his run as fact — not rumor.